Reo Fortune was a New Zealand social anthropologist. Originally trained as a psychologist, a Cambridge graduate (1928–1935), Fortune was a lecturer in social anthropology at the Cambridge University, and a specialist in Melanesian language and culture. He was married to Margaret Mead, with whom he undertook field studies in New Guinea, from 1928 to 1935. He is also known for his contribution to mathematics with his study of Fortunate numbers in number theory. As an anthropologist, his Sorcerers of Dobu remains the locus classicus of eastern Papuan anthropology. Fortune was a student of Malinowski, the famous Trobriand ethnographer. 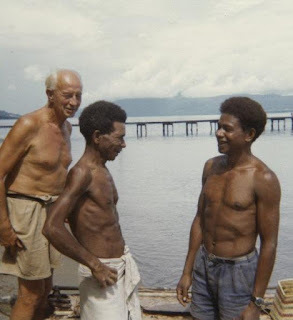 He spent five months with the "fourty odd souls" that inhabited Tewara Island (north of Fergusson Island), in the hamlet Kubwagai, one month with the people of Basima on Fergusson, and some months later he concluded his field work with a one month stay on Dobu Island itself. During his stay he aquired a good knowledge of the language "by contagion", as he claims. His classic book Sorcerers of Dobu contributed strongly to Massim ethnography and, according to Malinowski in his preface of the book, demonstrated the value of participant observation as a method of field work: "The present book may be regarded by the Functional Method as one of its triumphs in the field". In fact, Sorcerers of Dobu is a well written account of the social organisation of Tewara Islanders in the late 1920s. It covers many topics that are related to social life with a strong focus on economies (gardening, mortuary exchanges, kula exchange) and interpersonal relationships (marriage, conflicts within and between social groups, structural animosities and the effect of matrilineality). The highlight of his ethnography however is Fortune's information on male sorcery, called by him "the black art". He collected an extraordinary amount of spells and techniques although this knowledge is regarded as amongst a person's most precious possessions. Perhaps partly due to his quite grizzly main topic his impression of "The Dobuan" was very negative. According to his former wife, Margaret Mead, he stated later on that he did not like them at all. His experience was that it was "an individualistic and quarrelsome society". Fortune's work can still be seen as a historically interesting account of the Dobu language area.